As part of Project X, the flagship programme of SingaPlural, four design studios are challenged to use solid surface - a hard material made of substances such as acrylic and usually used for kitchen countertops - to create new products.Teaming up with Luxx Newhouse, a manufacturing company that also distributes solid surface materials, they have come up with products such as lights, a modular installation and discs that have geographical landforms carved into them. More accustomed to designing and developing smartphone apps and websites, design and technology studio Voidworks steps out of its comfort zone to create eight discs that have geographical landforms mapped onto the surfaces. Using elevation data from satellites, designers Fung Kwok Pan, 30, and Gerald Yeong, 28, created a 3D model that had the forms mapped out onto the disc. A computer numerical control machine - known as a CNC machine - then carved out the landforms into the solid surface material. Try and spot well-known places such as the Swiss Alps, Mount Kenya, the Amazon river in South America or Mount Fuji in Japan on the all-white discs. Mr Fung, who is Voidworks' founder, says: "We choose these places because of their features. It also allowed us to test how deep we could cut the solid surfaces to carve out the rivers and valleys." Timo Wong and Priscilla Lui. 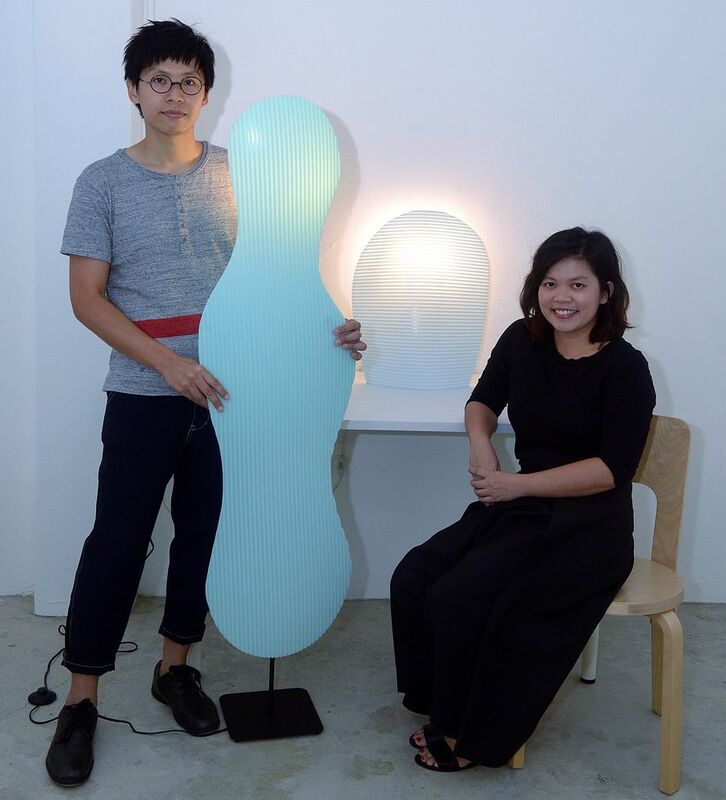 Design duo Timo Wong, 33, and Priscilla Lui, 32, take the tough solid surface and softens it into organic forms in three lampshades. There is a floor lamp, wall lamp and table lamp, all featuring shell-like shades that are thin and have soft contours. The shades were moulded at high heat when the material is malleable. Placed in front of a light bulb, the shades glow while the ridges carved into the pastel solid surface material are highlighted, giving the shades a chic look. The lamps are held up by metal frames that are so skeletal, the structures are barely noticeable when viewed from the front. Studio Juju's exhibition space is set up in a labyrinth, says Ms Lui. Shielded by 2.4m-tall plywood screens, visitors have to navigate around to find the lamps. She says: "Instead of having visitors see the lamps immediately, we want them to discover the lamps. When they do, they will also be able to see that there is a poetic element to such a hard material." (From far right) Ms Wong Zi Xin, 27; Ms Montakan Manosong, 26; Mr Nuntawat Tasanasangsoon, 33; and Ms Fiona Chua, 25. As tabletops, solid surface comes in big slabs. But the designers from architectural firm Park + Associates cut the material into smaller blocks and opted for a matt finishing instead of the usual glossy look. There are 200 pieces of these angular modules. Some of these are fixed in position, while visitors can move and arrange the rest of the pieces for various configurations. The blocks are illuminated by LED light strips stuck along the inner perimeter and mounted on plywood using an adhesive. The four architectural designers are Ms Wong Zi Xin, 27; Ms Montakan Manosong, 26; Mr Nuntawat Tasanasangsoon, 33; and Ms Fiona Chua, 25. Ms Wong says their experiment allows for solid surfaces to be used in different scales and users - as a decorative wall cladding in a home or on the facade of a building. 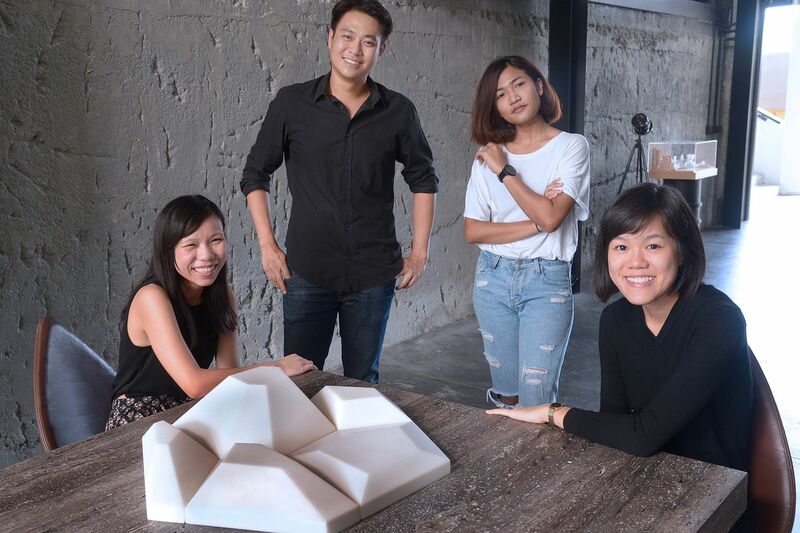 Mr Nuntawat adds: "We didn't want to design a finished product, but rather, we wanted to start an open-ended discussion on how solid surfaces can be customised for different things and users." 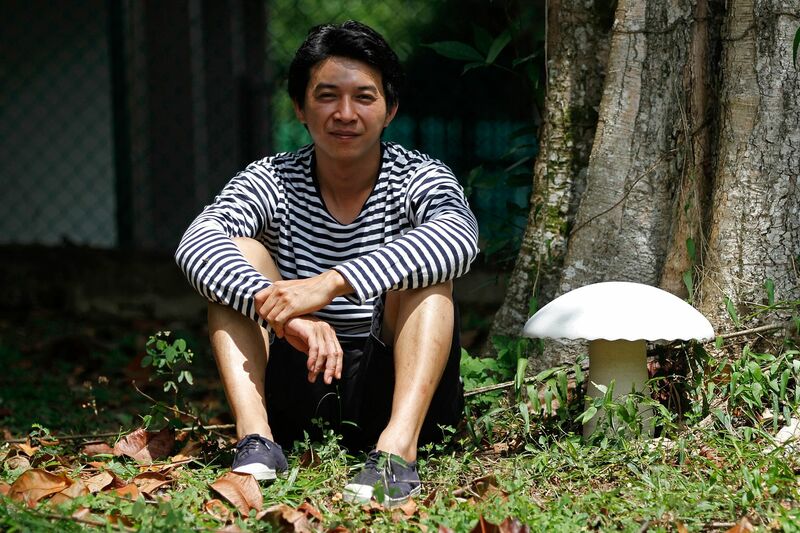 Ceramics collective Weekend Worker takes inspiration from the humble mushroom to make a series of 12 light fixtures. Pairing ceramics and the solid surface material, the mushrooms are supersized to show the fungus' intricate details. The lights come in various shapes and heights. One of the pieces has a dome-shaped cap with a ceramic body. Light glows through the translucent surface and highlights the mushroom's gills on the underside of the cap and its scalloped rim. Light is also triggered by sensors - the designers wanted to create some interaction with visitors. Supersizing the product also lets the studio "step out of its comfort zone". Weekend Worker is a trio made up of Mr Ivan Lee, 33; Mr Ong Su Loon, 41; and Ms Chloe Tan, 29. Mr Lee says: "Ceramics are usually small pieces, so this project allowed us to try something bigger. "Solid surface is also an unusual material to pair with ceramics - it's usually fabrics, glass or wood - and we aren't product designers by training, so we had to think of ways to make the lamps work with both materials."